The devastating flood damage wreaked by Tropical Cyclone Debbie has left many residents in northern New South Wales facing an enormous cleanup that could take months. Any Lismore local will tell you that flooding is a fact of life in the Northern Rivers. In the floods of 1954 and 1974, the Wilsons River rose to a record 12.17 metres. This time around, the river peaked at 11.59m, breaching the flood levee built in 2005 for the first time. So what are the conditions that caused those historic floods? And are they any different to the conditions of 2017? Like the current flood, cyclonic rains also caused the 1954 and 1974 events. But unlike those past events, both of which were preceded by prolonged wet weather, almost all of the extreme rainfall from ex-Tropical Cyclone Debbie fell within 24 hours. More interesting still is the fact that we are not currently experiencing La Niña conditions, which have historically formed the backdrop to severe flooding in eastern Australia. The 1954 flood was preceded by an east coast low from February 9-11, followed by a decaying tropical cyclone from February 19-22. Thirty people were killed as flood records were set in Lismore, Kyogle, Casino, Nimbin and Murwillumbah. Some places received more than 1,000mm of rain in 14 days. In 1974, former Tropical Cyclone Zoe unleashed torrential rain over Lismore, Wyrallah and Coraki. From March 10-13, some stations received almost 1,000mm in just four days. One analysis described the flood as a once-in-70-year event. This time around, the remains of Tropical Cyclone Debbie delivered extreme rainfall to northern NSW towns including Murwillumbah, Chinderah and Lismore, despite having crossed the coast several days earlier and more than 1,200km to the north. Floods as far apart as Rockhampton in central Queensland and northern New Zealand show the storm’s colossal area of influence. During the event, 20 rainfall stations in Queensland and 11 sites in NSW recorded their wettest March day on record. Mullumbimby, in the Brunswick River catchment, received a staggering 925mm during March – over half the annual average in a single month – causing major flooding in the region. The heaviest rainfall in the Wilsons River catchment was at Terania Creek, which received 627mm over March 30-31, 99% of it in the 24 hours from 3am on March 30. Lismore recorded 324.8mm of rain in the 18 hours to 3am on March 31, its wettest March day in more than 100 years. A little further out of town, floodwaters submerged the gauge at Lismore Airport, so unfortunately we do not have reliable figures for that site. 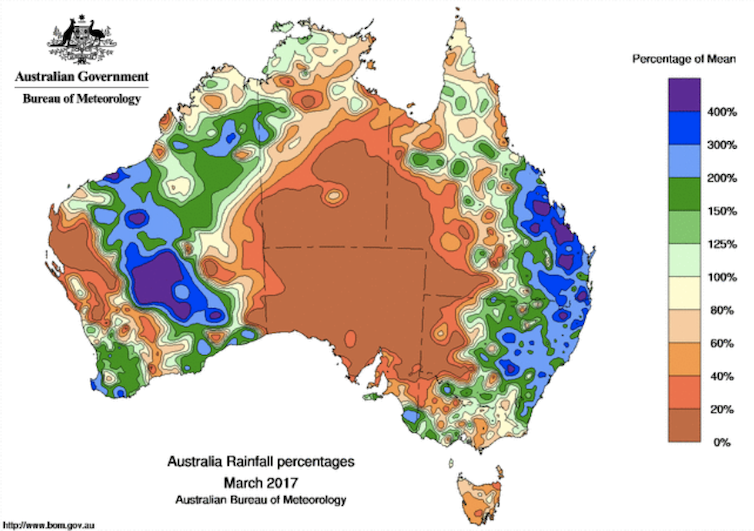 March 2017 rainfall across Australia. Tropical Cyclone Debbie’s track down the east coast is visible in the trail of above-average falls. The main difference between the current flooding and the 1954 and 1974 floods is that the previous events both occurred against a background of sustained La Niña conditions. These tend to deliver above-average tropical cyclone activity and high rainfall totals, which increase flood risk. During the early 1970s, Australia experienced the longest period of La Niña conditions in the instrumental record. This unleashed phenomenal deluges across virtually the entire country. By the end of 1973, many catchments were already saturated as the wet season started early, culminating in the wettest January in Australia’s rainfall records. In 1974 the Indian Ocean was also unusually warm (what meteorologists call a “negative Indian Ocean Dipole (IOD) phase”), further enhancing rainfall in the region. When negative IOD events coincide with La Niña conditions in the tropical Pacific, the warm sea temperatures reinforce one another, resulting in more evaporation and increased rainfall. This double whammy resulted in the exceptionally wet conditions experienced across the country during 1974. In January 1974, the Northern Territory, Queensland and Australia as a whole recorded their wettest month on record, while South Australia and New South Wales recorded their second-wettest January on record. Torrential monsoon rains in the gulf country of Queensland transformed the normally dry interior into vast inland seas, flooding all the way to Lake Eyre in the arid zone of South Australia. 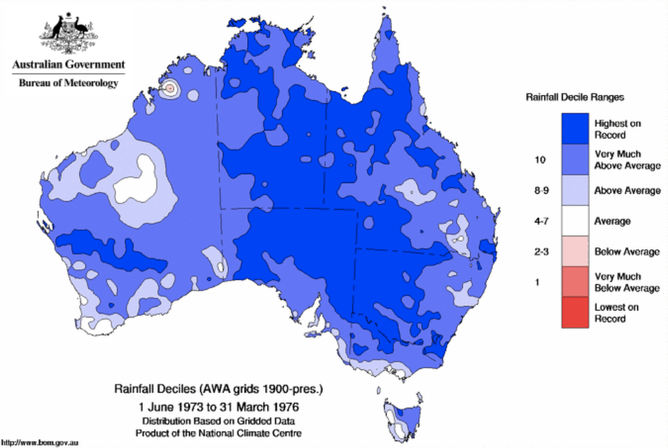 Vast swathes of Australia were much wetter than average during the mid-1970s. In contrast, Tropical Cyclone Debbie formed under neutral conditions, rather than during a La Niña. In fact, the Bureau of Meteorology is currently on El Niño watch, meaning that there is double the normal risk of an El Niño event bringing low rainfall and high temperatures to Australia by mid-2017. So, unlike the 1950s and 1970s, the current flooding happened despite the absence of conditions that have driven major flooding in the past. It seems extraordinary that such a damaging cyclone could develop under these circumstances, and deliver such high rainfall over such a short time. This suggests that other factors may be at play. A rapidly warming climate means that storms are now occurring in a “super-charged” atmosphere. As temperatures increase, so does the water-holding capacity of the lower atmosphere. The oceans are also warming, especially at the surface, driving up evaporation rates. Global average surface temperature has already risen by about 1℃ above pre-industrial levels, leading to an increase of 7% in the amount of water vapour in the atmosphere. 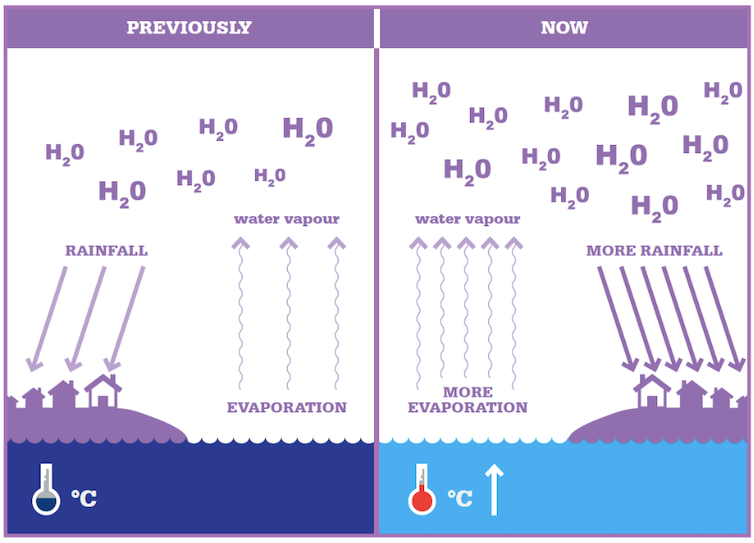 Ocean evaporation, before and after ocean warming. Of course, it is hard to determine the exact impact of climate change on individual storms. However, climate scientists are confident about the overall trends. Australia’s land and oceans have warmed by 1℃ since 1910, with much of this warming occurring since 1970. This influences the background conditions under which both extremes of the rainfall cycle will operate as the planet continues to warm. We have high confidence that the warming trend will increase the intensity of extreme rainfall experienced in eastern Australia, including southeast Queensland and northern NSW. While it will take more time to determine the exact factors that led to the extreme flooding witnessed in March 2017, we cannot rule out the role of climate change as a possible contributing factor. CSIRO’s latest climate change projections predict that in a hotter climate we will experience intense dry spells interspersed with periods of increasingly extreme rainfall over much of Australia. Tropical cyclones are projected to be less frequent but more intense on average. That potentially means longer and more severe droughts, followed by deluges capable of washing away houses, roads and crops. Tropical Cyclone Debbie’s formation after the exceptionally hot summer of 2016-2017 may well be a perfect case in point, and an ominous sign of things to come. Cyclone Debbie, which lashed the Queensland coast a week ago, has hit farmers hard in the area around Bowen – a crucial supplier of vegetables to Sydney, Melbourne and much of eastern Australia. With the Queensland Farmers’ Federation estimating the damage at more than A$100 million and winter crop losses at 20%, the event looks set to affect the cost and availability of fresh food for millions of Australians. Growers are reportedly forecasting a price spike in May, when the damaged crops were scheduled to have arrived on shelves. The incident also raises broader questions about the resilience of Australia’s fresh vegetable supply, much of which comes from a relatively small number of areas that are under pressure from climate and land use change. In 2011 the Bowen area produced 33% of Australia’s fresh beans, 46% of capsicum and 23% of fresh tomatoes, making it the country’s largest producer of beans and capsicums, and number two in fresh tomatoes. The region also produces a significant amount of chillies, corn, cucumbers, eggplant, pumpkin, zucchini and squash, and is a key production area for mangoes and melons. Coastal Queensland’s vegetable regions are among the highest-producing in the country, especially for perishable vegetables. The Whitsunday region around Bowen, and the area around Bundaberg further south are each responsible for around 13% of the national perishable vegetable supply. As the chart below shows, vegetable production is highly concentrated in particular regions, typically on the fringes of large cities. These “peri-urban” regions, when added to the two major growing areas in coastal Queensland, account for about 75% of Australia’s perishable vegetables. Proportion of State Perishable Vegetable Production by weight. Australia’s climate variability means that most fresh produce can be grown domestically. The seasonable variability allows production to move from the south to the north in the winter, when the Bundaberg and Bowen areas produce most of the winter vegetables consumed in Brisbane, Sydney and Melbourne. The Bowen Gumlu Growers Association estimates that during the spring growing season in September—October, the region produces 90% of Australia’s fresh tomatoes and 95% of capsicums. Besides damaging crops, Cyclone Debbie has also destroyed many growers’ packing and cool storage sheds. The cost of rebuilding this infrastructure may be too much for many farmers, and the waterlogged soils are also set to make planting the next crop more difficult. 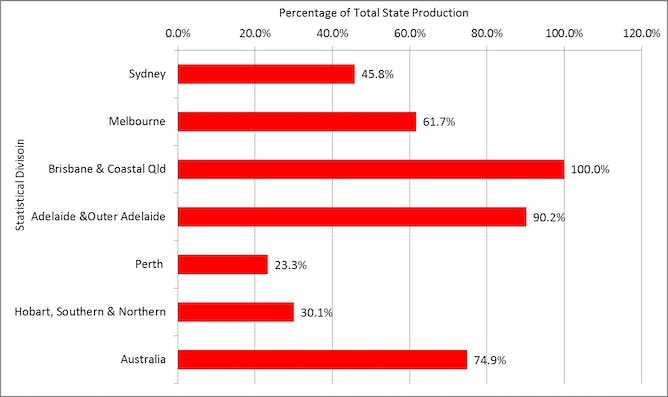 The recovery of production in these areas is crucial for the supply. Growers who have lost their May crop will first have to wait until the paddocks dry out, then source new seedlings and plant them. It could be weeks until crops can be replanted, and storage and processing facilities replaced. The Queensland government has announced natural disaster relief funding, including concessional loans of up to A$250,000 and essential working capital loans of up to A$100,000, to help farmers replant and rebuild. Meanwhile, consumers of fresh vegetables in Sydney and Melbourne and many other places are likely to find themselves paying more until the shortfall can be replaced. Australia’s cities are growing rapidly, along with those of many other countries. The United Nations has predicted that by 2050 about 87% of the world’s population will live in cities. This urban expansion is putting ever more pressure on peri-urban food bowls. Food production is also under pressure from climate change, raising the risk of future food shocks and price spikes in the wake of disasters such as cyclones. Meanwhile, the desire for semi-rural lifestyles is also conflicting with the use of land for farming (see Sydney’s Food Futures and Foodprint Melbourne for more). These pressures mean that Australia’s cities need to make their food systems more resilient, so that they can withstand food shocks more easily, and recover more quickly. increased use of protected cropping systems such as greenhouses, which are better able to withstand adverse weather. Two recent studies of food production around Sydney and Melbourne provide examples of a range of mechanisms and policies for increasing the resilience of the food systems of Australian cities. Our food system has served us well until now, but land use pressures and climate change will make it harder in future. When a cyclone can knock out a major production region overnight, with knock-on effects for Australian consumers, this points to a lack of resilience in Australia’s fresh vegetable supply. Tropical cyclone Debbie has made landfall in Queensland as a category 4 cyclone with winds of more than 150 kilometres per hour. The cyclone crossed the coast near Airlie Beach on Tuesday afternoon. Reports of wind gusts in excess of 200km per hour and rainfall of more than 200mm of rain have been made in some areas along the central Queensland coast. The Bureau of Meteorology forecasted an average to above-average number of Australian cyclones in its October severe weather outlook. Australia receives 11 cyclones on average each year, with about four of those in Queensland. Debbie is the fifth cyclone of the season for Australia as a whole and the most intense of the season so far. Anomalously high moisture, warm ocean temperatures, and low environmental pressures seem to have created the conditions that allowed TC Debbie to form and grow in intensity. Tropical cyclones are low pressure systems that form over warm tropical oceans. The warmth and moisture of the oceans are what gives a cyclone its energy. The low pressure, which meteorologists measure in “hectopascals”, draws in the surrounding warm, moist air, which then rises into deep thunderstorm clouds. As the air is pulled into the centre of low pressure, Earth’s rotation causes it to spin cyclonically and it continues to intensify. TC Debbie formed at the eastern end of an active monsoon trough extending from the Indian Ocean across the top of Australia and into the Coral Sea. The monsoon trough is a region of low air pressure and thunderstorms that forms over northern Australia in the summer months, bringing with it the wet season. On March 22, a large region of active thunderstorms began to organise into a weather disturbance off the eastern tip of Papua New Guinea. Over the following two days the thunderstorms organised about a circulation centre as sea level pressures began to drop and moist air converged into the area. By late on March 24 a tropical depression, a forerunner of a cyclone, had formed and begun to drift south, making a long S-shaped track. Tropical Cyclone Debbie was named on March 25. It then came under the influence of the subtropical ridge, a zone of stable high pressure that gives much of Australia’s fine weather during the summer. This drove Debbie west-southwest towards the Queensland coast while it gradually intensified further. Because of the relatively high amounts of moisture in the atmosphere, and relatively warm ocean waters, Debbie intensified to category 4 by 10 pm on March 27, with the strongest wind gusts reaching 225-280km per hour. On Tuesday afternoon Debbie was a strong category 4 cyclone with a central pressure of 943 hectopascals and surface sustained winds of 185 kilometres per hour. The Bureau of Meteorology downgraded TC Debbie to a category 3 at 4:00 pm EST. To put Debbie in context, there has been only one cyclone since 1980 to have made landfall in Queensland with a lower central pressure. That was Yasi in 2011. Of the 46 cyclones to have made landfall in Queensland since 1980, only three others arrived at the coast with pressures of less than 960 hectopascals: Dominic in 1982, Winifred in 1986, and Ingrid in 2005. Tropical cyclone forecasters use a variety of tools to forecast the storm’s track, intensity, storm surge, and rainfall. Because it is difficult to obtain observations of wind at the ocean’s surface under a cyclone, meteorologists have developed tools based on satellite imagery to estimate a storm’s intensity, location, and where the strongest and most destructive winds are found. Several models are also used to aid in making forecasts – from the complex numerical weather prediction models, to statistical models. Models start by using observations of the atmosphere, and then use these data to make a forecast. Depending on their level of complexity the models can predict the future track, intensity, rainfall, wave height, and/or storm surge. The forecasters access all of this information to then make their forecast. Cyclone forecasts have improved considerably over time. In particular, track forecasts have improved so that the 48-hour forecast is now more accurate than the 24-hour ones were back in the early 1990s. Track forecasting has become so reliable that the US National Hurricane Centre now produces 120-hour track forecasts. Intensity forecasts have improved more slowly, but as models have become more refined and satellite technology has improved, the ability of forecasters to accurately estimate and predict intensity is also getting gradually better. The prediction of rainfall, the extent of the damaging wind field, and storm surge forecasts are also slowly improving. Now that they are receiving more attention, we can expect considerable improvements in these over the next decade. Survivors of Cyclone Pam on the South Pacific islands of Vanuatu are bracing for a lack of food over the coming months because crops were destroyed in the recent storm. Much of the archipelago’s population relies on subsistence farming and when the monster cyclone ripped through the country last week it wiped out livelihoods as well as homes. “There’s always a lot of attention in the beginning, the first few weeks of a big disaster. But now, we’re looking at a hunger gap over the next three to six months,” said World Vision’s Emergency Operations Manager in Vanuatu, Alex Snary. Aid agencies are rushing to deliver desperately needed supplies, especially to communities on the remote outer islands, which are still out of contact. At least 11 people were killed in the disaster and 3,3000 displaced. Vanuatu’s President Baldwin Lonsdale says the tiny South Pacific island nation has lost much of its development due to the havoc wreaked over the weekend by “monster” Cyclone Pam. Lonsdale went on to say that climate change contributed to the devastation as the low-lying islands of the Pacific are suffering from rising sea levels. International aid agencies along with military personnel from Australia, France and New Zealand have arrived in Vanuatu to assess the damage and deliver much needed aid and supplies.